Building Badger is a collaboration between Jay Benford, the designer, and Pete Hill, the builder. The first section of the book is an extended essay and with photos and captions written by Pete, following the building of the Badger. The 34' Badger is featured in Annie Hill's books, Voyaging On A Small Income, a marine best-seller, and Brazil And Beyond. The Hills sailed her over 100,000 miles. 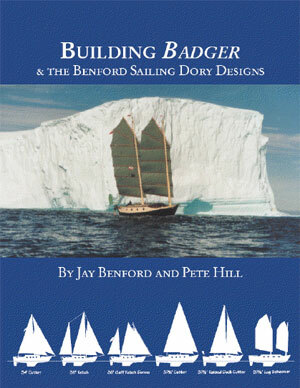 The second part is a series of chapters on the Benford dory designs, from 19' to 45', with detailed drawings of these cruising boats. These will help understanding of how the boats are designed and built, providing lots of dreaming material for those planning their escape. Jay Benford was taken sailing before he could walk, by parents unconcerned about the impressions being made on the youth. He was several years old before he determined that his might not have been perfectly normal procedure on the part of his parents. By then, of course, it was too late, for he had become hooked on cruising. He lived aboard for well over a decade, on both sail and power boats, and brings this experience to all his design work. When not off cruising, he can be found in his design office working on one of his dozen or so current projects. Pete Hill has built and sailed a series of cruising boats, spending more of his time cruising than building, an enviable state! He has well-developed skills in building and this is evident to all who come aboard.